Being one of the longest revolutions in the colonial era, the Mexican Revolution lasted almost twenty years. From 1910 to 1930, people of all socioeconomic classes were fighting to overthrow the incumbent President Porfirio Diaz. Clearly, the dictator's tight clampdown on dissent, protest, and anyone who challenged his power provided a major motivation for change. Even some of the upper and middle class citizens sought to gain more political power so their opinions would be adequately heard, while the working poor wanted better social services and working conditions. Income inequality and powerful landowning men ensured that almost the entirety of Mexico was controlled by just a few thousand people. This situation contrasted with that of the United States' mainly because it involved many disparate groups often conflicting each other's goals, while American revolutionaries presented a unified front to counter British rule. Mexico's Revolution differed from other American revolutions mostly because its tumultuous changes were hindered by factions that developed within the general population, diminishing its ability to quickly cast aside an incompetent ruler. In contrast to the typical large colonial power breaking away from its mother country, Mexico had to fight through a divisive period that made it very difficult to decide on a new leadership. 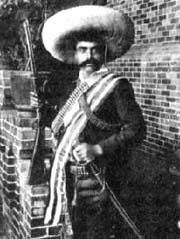 For example, Emiliano Zapata's de facto position as the opposition leader was never fully recognized by a majority of the population, since so many sides existed within the country. During the 1910's the situation had essentially devolved into outright civil war, with no clear leader to unite Mexico into a stable political system. Thus, it took many years for a new government and constitution to take hold in this environment. In all of the Atlantic Revolutions that occurred, it was Mexico's that had the greatest impact on the region and world. It was Spain's prize colony and spurred a significant reversal of power once its native population took power into its own hands. Similarly to the United States, its huge population provided the foundation for uprising, but the more conducive conditions in America led to a more successful revolutionary government. The fractured state in which Mexico's new government emerged ultimately doomed its existence, and many successive constitutions have replaced the original revolutionary one.